Guildford, the county town of Surrey, is a popular commuter belt town conveniently situated 30 miles to the southwest of London. It is densely populated with a diverse demographic; 137,000 people make Guildford their home. There are overall seven funerals directors in Guildford, many inside a five mile radius from the city centre. The choice of funerals directors in Guildford should make it easy for clients to select a suitable funeral home appropriate for their needs. Guildford Crematorium, run by Guildford Borough Council and situated in Shalford, was opened in 1967. It is a multi-faith facility capable of seating 100 guests, and it features an extensive garden of remembrance which is open throughout the year. The council also operates two other cemeteries. Stoke Cemetery at Stoughton Road was opened in 1939 and contains an area for fallen soldiers from the Second World War. The other is located on The Mount to the south west of the centre; it features a notable listed chapel and is the final resting place of Lewis Carroll, the author of Alice’s Adventures in Wonderland. 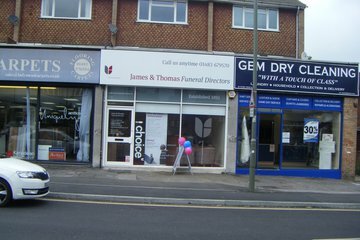 Search for local Guildford funeral directors now to see funeral homes near you. You can filter search results by best rated, most reviewed or nearest to you. Click on a funeral director’s listing to see their profile page, where you can read independent customer reviews, search for recent obituaries, and learn more about the funeral services they can offer to you. From the moment I spoke to Anita I knew she was the person to entrust with my mother's funeral. She was so compassionate and so sensitive at what is clearly a very difficult time. It was clear that for her, her work as a funeral director is not just a job, but a vocation. This made a huge difference to the whole thing. She was kind, efficient and generally a joy to deal with, and so were the staff on the day. I can't recommend her, and James & Thomas in Merrow, strongly enough.